Part 6. Samuel Gentry Jr.
As we near the end of a series of articles in this journal describing the extended family of Samuel-II Gentry, we will look at a group of Gentrys living in Old Ninety-Six District of South Carolina in the late 1700's and subsequently in Spartanburg District. One of these individuals, a Samuel Gentry (whom we label "the Elder") is surely Samuel-III Gentry, a son of Samuel-II. The other Gentrys are not as easy to identify. South Carolina had some peculiarities of history and nomenclature that can be confusing to the uninformed. In addition, it is always helpful to know a little about the history of an area when studying those who lived there. We briefly reviewed the history of Ninety-Six District in an earlier article (Gentry Journal, volume 2, issue 5), but will expand on that account here. The following is a brief summary of the early history of "up-country" South Carolina, beginning with its opening for settlement in 1755 when Governor Glen negotiated a treaty with the Cherokee Indians who ceded their hunting grounds to the whites. The earliest settlers were along the Pacolet and Tyger Rivers in the mid-1750's. Scotch-Irish from Pennsylvania and direct immigration from Northern Ireland arriving through Charleston, were the first to come. After the first influx, more settlers arrived from the north which gave easier access. These were mostly immigrants from Virginia, of English extraction and dissenters from the Established Church of the mother country. The topography and climate of Spartanburg District was very favorable. The distribution of rivers, numerous springs and small creeks and the gentle slopes of the watershed combined to make the area one of the best in the Eastern United States for farming and grazing. It was difficult to make money farming, however, because of the lack of a transportation system. Even so it was a popular site for pioneer settlers to establish new lives. Originally the area was all a part of Craven County, which dated from 1685. In 1769, Ninety-Six District was created, extending to the Georgia and North Carolina borders. The latter boundary was uncertain, and grants from North Carolina in Mecklenburg and Tryon Counties overlapped with grants from South Carolina in Ninety-Six District. A Commission of the General Assembly in 1783 and 1785 laid off Ninety-Six District into six smaller counties for greater ease in administration and attendance at courts. Abbeville, Edgefield, and Newberry Counties were created in 1783. 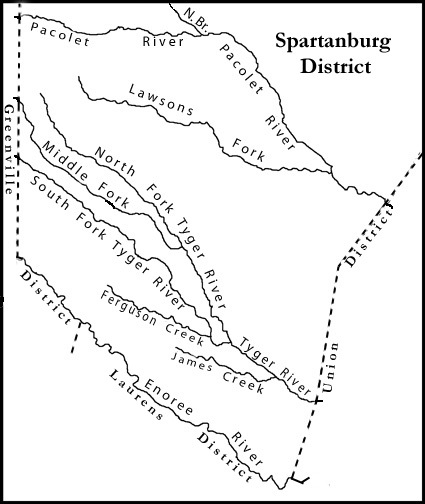 In 1785, Spartanburg, Laurens, and Union Counties completed the division of Ninety-Six District. Following this partition, the Ninety-Six District Circuit Court met on an established schedule at each of the county seats, while county courts and county officials were established in each county separately. The first Spartanburg courthouse was built in 1787 at the present location of the city of Spartanburg. An Act of 1798-1799 abolished county courts. Thereafter each of the six counties was designated a District, with a separate District Circuit Court. On 1 Jan 1800, Spartan County became interchangeably Spartan District and Spartanburgh District. Through usage and time, the "h" in Spartanburgh was dropped, and the name evolved to Spartanburg. 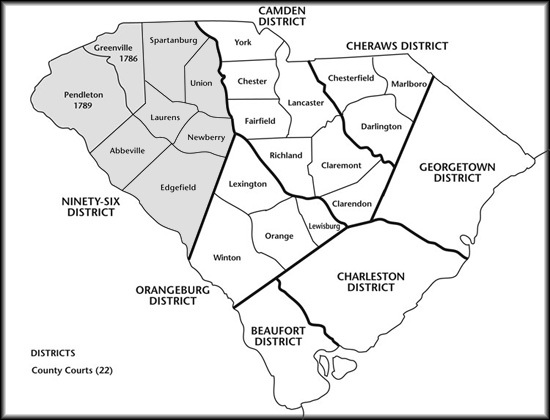 All South Carolina "Districts" remained such until the adoption of the Constitution of 1868 at which time (under Federal pressure), the designation "County" was adopted. We may also mention that a stumbling block for genealogists working with early South Carolinians is the fact that there was no mechanism for recording marriages until modern times. We can draw information from deeds where dower was relinquished, or from probate records, but for the most part, marriage information is lacking. Still another factor that should be kept in mind is that South Carolina revoked all colonial land grants at the start of the Revolutionary War. New grants were not issued until after the end of the war. Thus records of land grants dating after the war may not reflect the date at which the land was first occupied. Four Samuel Gentrys were living in the Spartanburg district of South Carolina during the period between the 1790 and 1800 censuses. To minimize problems in identifying these Samuels, the author has adapted the system used by the residents of Louisa County, Virginia in the mid-1750's in identifying three contemporaneous Nicholas Gentrys. The oldest of the three, whom we propose to identify as Samuel-III, the son of Samuel-II Gentry, is referred to herein as Samuel the Elder (or sometimes as Samuel Senior). We will refer to his son as Samuel Junior. The second-oldest Samuel, is referred to as Samuel the Younger. He appears in a number of references prior to 1800 and is in the 1790 census along with Samuel the Elder. Finally, one of the sons of Samuel the Younger was also a Samuel and we shall simply refer to him as the son of this Samuel. The author has used his judgment in differentiating between the two older Samuels in South Carolina references that could refer to either, and also between the two younger Samuels. In the records of Surry County, North Carolina, differentiating between Samuel-III Gentry and his nephew Samuel, the son of Joseph-III Gentry, is also difficult in a number of references. Again the author has used his judgment in deciding which is which. In the North Carolina references, Samuel-III is identified as such, whereas the other Samuel is identified as the son of Joseph. During the time that members of Samuel-II Gentry's family were living in Lunenburg County, Virginia, there are only four references that can be attributed to Samuel-III, and none of them are in Lunenburg County. In 1761 and 1762 in three Johnston County, North Carolina references<1> a Samuel Gentry is identified as a surveyor's chainbearer. These were occasioned by two separate surveys carried out for platting land for John Spencer and David Allen respectively, along the Neuse River. How can we rationalize this Samuel Gentry as being one of the sons of Samuel-II? There is only one prior reference in Johnston County to a Gentry (namely, John Gentry who witnessed a deed in 1759) and no subsequent references to any Gentrys. This leads to the supposition that any Gentrys who were present in that county were only in a visiting or transitory status. David Gentry was described in Lunenburg County in a 1759 deed as being "of Johnson [sic] County, North Carolina", although apparently he did not remain there. From this we know that David was in North Carolina for a period of time and it is reasonable to suggest that Samuel (who we propose to be a nephew) may have accompanied David during that time. In 1767, Samuel Gentry witnessed a deed for sale of land along Mountain Creek in Mecklenburg County, Virginia (which was separated from Lunenburg County in 1765<2>). This creek runs into the Meherrin River which forms the county border with Lunenburg County. The land in question appears to be adjacent to land which William Allen (the buyer in this transaction) purchased in 1759, and also adjacent to a James Arnold who was a neighbor in both instances. Interestingly, the 1759 purchase was witnessed by David Gentry, and involved trading land which William Allen owned in Johnston County, North Carolina, for the Virginia land. Our conclusion is that the Samuel who witnessed in 1767 is the same Samuel as the one involved in the 1761 and 1762 surveys. We don't know whether Samuel was living in Mecklenburg County at the time, or was living across the Meherrin River in Lunenburg County. This was an area, at the mouth of Crooked Creek, that was involved in a series of transactions involving Gentrys and Allens. In 1759, David Allen (of Johnston County) and Allen Gentry sold 100 acres of land in the vicinity. In the same year, William Allen traded land in Johnston County for his property on Mountain Creek in the transaction mentioned above. In 1760, Francis Wray sold 197 acres to John Brooks (father-in-law of Abednego Gentry, son of Allen). This was witnessed by William Allen, William Gentry, and David Gentry. In 1763, William Gentry sold land to Allen Gentry. It has occurred to this writer, that with this close association of Gentrys and Allens, both in Virginia and in Johnston County, North Carolina, that Samuel may have married an Allen and lived with one of them for a number of years after the other Gentrys moved away. Following the one reference to Samuel Gentry in Virginia in 1767, there is a fourteen year gap in time before we can identify another reference to him. The author has no idea what he was doing during that time, but if pressed for a guess, it would be that he spent much of that time with one or more of the Allen family in Virginia, and then perhaps moved to Old Ninety-Six District in South Carolina to join other Gentrys there. There is no evidence during this time that he was located in Surry County, North Carolina. Beginning in 1781, a Samuel Gentry appears in the tax and land records of Surry County, North Carolina under circumstances that clearly differentiate him from a contemporaneous Samuel who was the son of Joseph Gentry. While there is nowhere a direct tie between this older Samuel and the Samuel Gentry of Virginia, the presence of Samuel with the same Gentry siblings who all lived previously in Lunenburg County, is virtually conclusive evidence that Samuel was a part of the Samuel-II family. A timeline for Samuel beginning with this 1781 reference is given below. 1781 Samuel taxed in Surry County, North Carolina, for 600 acres of land, 3 horses and 6 cows. There are no tax records for the preceding years from 1775 to 1780 during the time of the Revolutionary War, so we have no idea when Samuel first occupied this land. However, during this time there were no instances of serving as a witness, being cited as a neighbor, or involved in any court action. Presumably this was the same land for which he entered a claim for a state grant which eventually was consummated in 1792. 1782 Samuel taxed for 400 acres, 3 horses and 6 cows on Fox Nob, in the same tax district where his Fox Nob neighbor, his brother, Richard Gentry, plus four Gentrys from South Carolina who apparently came, looked, and went back home again. These were his cousin Hezekiah Gentry (and two sons, Robert and Runnel), and Nathaniel Gentry. These Gentrys were assessed for one to three horses only, no land, and no cows. They did not appear in any other Surry County tax lists either before or after that time so obviously were transients. 1784 Two transactions on land involving Fox Nob make reference to Samuel Gentry as a neighbor. 1786 Samuel taxed for 400 acres of land and 1 white poll. 1791 Samuel listed in 1790 federal census for Spartanburg District, South Caroline, with presumably wife and three sons in household. 1792 Samuel's claim for a state land grant was consummated and title passed to him. The long delay in completing the grant process was probably due to a delay in accumulating the final fee that was required for payment. 1801 Heirs of Samuel, deceased, of South Carolina, namely Allen, Nicholas, Jeremiah and Samuel Gentry sold 400 acres of land on Fox Nob in Surry County, North Carolina, to Humphrey Cockerham. Humphrey then turned around and a couple months later sold 100 acres of this land to Samuel's neighbor, Moses Woodruff. As a point of incidental interest, Humphrey Cockerham may have been a son of a Moses Cockerham who was named in several land transactions in Lunenburg County, Virginia, including a purchase of land from Joseph Gentry. These references clearly show that Samuel must have left his plantation in North Carolina and moved to South Carolina before 1790. There is no clue as to who may have farmed the land in his stead for some ten years until it was sold, or if it was just left vacant. Perhaps Samuel had an arrangement with his neighbor Moses Woodruff to use the land in his absence. The location of the grant was on the slopes of Fox Nob (or "Knob") a prominent hill at the headwaters of Deep Creek in old Surry County. [Today, after a division of Surry County, the hill is located in Yadkin County.] This may have been "left-over land", not ideal for farming crops and better suited to pasture use, but 6 cows do not seem like a large herd to raise on this much land. While there are a limited number of references to Samuel's sons in the Spartanburg District records, the only reference to Samuel Sr. is in the 1790 census<21a>. It is here that we have to distinguish between Samuel the Elder (whom we identify as Samuel-III or Samuel Sr., who is found on p.26 of the census with a household listing of 2 - 2 - 1) and Samuel the Younger (who is on p. 19 with a household listing of 3 - 2 - 5 adult males, males under the age of sixteen and females respectively). Samuel the Elder's oldest son, Allen is included separately in this census, but his three other sons, and Samuel himself are listed under Samuel's name. By the time of the 1800 census<21b>, Samuel the Elder is missing, presumably having died that year or in the immediately preceding period (based upon his North Carolina property being sold in 1801). Three of Samuel's sons are listed separately in the 1800 census, namely Allen, Nicholas and Jeremiah. Samuel the Younger and a son, Reuben, are also in the 1800 census. A second, younger Samuel in the same census is almost surely a son of Samuel the Younger. He is listed with a date of birth of 1774 to 1784, roughly five years older than Samuel Jr (see below), and recently married. This Samuel shows up again in the 1810 Spartanburg census (born 1765-1784), with five children under the age of ten<21c>. As will be seen below, Samuel Jr., son of Samuel-III, is believed to have eventually moved to Spencer County, Indiana along with cousins from Surry County, North Carolina. The Indiana Samuel, listed as age 65 in 1850 (born about 1785), had a son Allen who was age 41, thus born about 1809. It is difficult to conceive of this Samuel being the same as the Samuel named in the 1800 census, and being married by 1800 at an age of only 15. The author has concluded that the Indiana Samuel could not have been in the 1800 South Carolina census, and must have left the state before then, probably going first to North Carolina where he was present in 1801 for the selling of his father's land. We have mentioned above that, Samuel's son Allen is listed individually in the 1790 census, and two of the other three sons were also in the 1800 census. The author has estimated that Allen may have been born about 1764 in Lunenburg County, Virginia. Allen's name is found in at least one court record in 1798<5>. He also is included in a number of deed and trust records beginning in 1792. In 1802 he sold his homestead property on Ferguson Creek (see map, Fig. 2) which he had first bought in 1793 and is believed to have left South Carolina<7g>. There is no clear evidence of where he went, but the most likely speculations are that he went to the Indian territory in southeastern Tennessee. This writer believes that the Sally Gentry who appears in the 1810 Spartanburg census was Allen's wife who stayed behind in South Carolina while her husband and their older sons., were perhaps looking for a new home. Samuel's second son, Nicholas, was probably born in about 1769 or 1770 (census records are not consistent). Nicholas is the son present with Samuel in 1790 who was over sixteen years of age. His name is first found in Spartanburgh District records in 1799 when he and his brother Jeremiah were cited as adjoining owners of land on the south branch of the Tyger River in a deed of sale<7d>. The records for the purchase of this land are missing. Three deeds, dated 1810, 1821, and 1822<7h,i,j>, all involved sales of land along Ferguson's Creek and the Tyger River. In the last of these, his wife, Sarah, is identified. Nicholas was included in the 1800 to 1820 Spartanburg District censuses and again in 1840. He is missing from the 1830 census. He apparently died soon after 1840 for both he and his wife are missing from the 1850 census. Two probable sons, Sevier (or Severe) and Riley, are mentioned briefly in deeds, living in the same area of Spartanburg District<8a,b,d>. Riley was present in the 1850 Spartanburg census, but Sevier apparently died before then and his widow "M." was the head of his family household. The third son of Samuel Sr., Jeremiah (or Jerry/Jerrey) was probably born about 1774 (again census records are not consistent). He and Samuel Jr. were the two sons of Samuel Sr who were under age sixteen in the 1790 census. Jeremiah served as a juror in the county court and a case against him in court was dismissed<6>. Both of these references were in 1806. In 1799, Jeremiah was cited (along with his brother Nicholas) as a neighbor in a land sale along the South Tyger River<7d>, and two years later, Jeremiah witnessed a deed for another neighbor<7e>. Jeremiah was in the Spartanburg censuses until 1820. He died about 1835. His widow, Sarah is believed to have been living with their son, Jeremiah Jr., in 1840. She may be the Sarah or Sally Gentry who appears in three Spartanburg deed references between 1836 and 1845, living along the Enoree River<8c,e,g>. Jeremiah Jr. moved to Cass County, Georgia before 1850 and to Floyd County, Georgia before 1760. An older son, may have been the Shaderick/Shedrick Gentry who moved to Roane and McMinn Counties, Tennessee, then to DeKalb and Jackson Counties, Alabama. Another son, Allen, was in both the 1840 and 1850 Spartanburg censuses although some of his family are believed to have also moved to Cass County, Georgia. The youngest son, Samuel Jr. does not appear by name in any South Carolina records. He is believed to be the Samuel Gentry who was in Ohio County, Kentucky, in 1810<21c>, and thereafter in Spencer County, Indiana along with several sons of his namesake cousin Samuel of Surry County, North Carolina, and Barren County, Kentucky (son of Joseph-III Gentry). In 1850, Samuel Jr was listed as age 65 (born about 1785 in South Carolina), his wife "Susiana" was listed as age 69 at the time, and they were living with a son Allen, age 41, born in Kentucky. As for all the members of the Samuel-III family, census age records are inconsistent for Samuel Jr. If the ages of Jeremiah and Samuel Jr. are approximately correct, there is a sizeable gap between them. If any children were born to Samuel Sr. during that period of time, they should have been of an age where one would expect them to still be living with their parents at the time of the 1790 census. It is conceivable that the female present in 1790 was a daughter of Samuel rather than his wife. On the other hand, Samuel was probably only about fifty years old in 1790, and it would be well within reason for his wife to still be living at that time. Thus, if Samuel had any children between Jeremiah and Samuel Jr., the chances are they died young. An alternative explanation is always possible and that is that Samuel had a fist wife who died after Jeremiah was born, and then there was an appreciable interval before he married a second time. We would be remiss in not mentioning a Polly Elizabeth Gentry who appears in some genealogy records as marrying John Ridings in North Carolina in 1757, and proposed as a daughter of Samuel Sr<9>. This writer has tried to find the source of this published information, which was passed on by a member of the Ridings family. There are several problems with the information as published in the cited publication. A major concern is the listed date of marriage, during a time when Samuel Gentry was in Lunenburg County, Virginia, and there were no Gentrys of any description living in North Carolina. The family of John Ridings is badly mangled, the children do not at all correspond to reliable family listings for John Ridings, and marriage dates are quite inappropriate for a marriage of John and Polly to have been in 1757. Considering the listed parents for John, this family does not seem to represent a different John Ridings than the one who lived for many years in Surry County, North Carolina, rather it was a case of misidentifying the members of his family. It appears that this citation has combined a number of facts concerning the Gentry and the Ridings families in a completely haphazard fashion. The known facts are that John Ridings did indeed marry a Gentry, but it was Anna Gentry, who was a daughter of Joseph-III Gentry. Anna's brother was a Samuel, but a nephew of Samuel-III. Joseph and his son Samuel were also involved in a sale of land to John Ridings. These combinations of circumstances may have led someone to put together their "facts" in an inappropriate manner. Despite the extreme scarcity of direct references to Samuel Gentry the Elder, these references and the circumstances of where Samuel lived at different times in his life, provide virtually conclusive proof of his parentage. Samuel was undoubtedly a son of Samuel-II Gentry and Samuel's wife Ann. We can very roughly estimate his date of birth as approximately 1738. It is probable that he was the next to youngest of Samuel-II's sons. In addition to Samuel the Elder and his family, a second, younger, Samuel Gentry was living in Spartanburg District beginning before the time of the 1790 Federal census and continuing until his death in 1819. We shall refer to him as "Samuel Gentry the Younger" for purposes of identification. The 1800 census reports him as older than 45 (born before 1755)<21b>. By combining census and other records, we can propose a family for him consisting of Reuben Gentry (born several years before 1774), a son Samuel (born probably just before 1774), a son Richard (born perhaps about 1783), and a son Nathaniel who was born about 1785 (according to the 1850 census). In addition he had four daughters born before 1790. With a total of eight children born before 1790, two of them before 1774, Samuel must have been married between 1765 and 1770. This places his date of birth probably about 1745. For a number of years this writer was of the opinion that this Samuel must have been a son of Nathaniel Gentry. In recent times, however, this opinion has changed as discussed in a recently published issue of this journal (Issue A, (Febr 2011) and he now believes that Samuel was a son of Nicholas and Mary Brooks Gentry of Louisa and Lunenburg Counties, Virginia, and Surry County, North Carolina. A variety of references to four of Samuel's sons are found in the Spartanburg deed books<11,12>, but only one that appears to refer Samuel himself<11a>. This is for the purchase of 35 acres of land between the South and North Forks of the Tyger River in 1804 (see Map 2.). Succeeding references to Samuel are believed to be for his son Samuel-V. Court records relating to a controversy over the settlement of Samuel's estate<13>, show that he died in 1819, that his wife's name at the time of his death was "Fanny" (Frances), that Nathaniel was a son who cared for his parents in their old age, and that Reuben Gentry was administrator of the estate. Apparently Samuel and his wife moved in with Nathaniel a couple years before he died. Reuben undoubtedly was the oldest of the four sons that remained in Spartanburg District. Reuben was listed in Spartanburg District census records for 1800, 1810, and 1820. He sold his land in 1821<11q> and moved to Anderson District (the successor of Pendleton District) where he was listed in census records in 1830 and 1840, and in various court references. Reuben died in Anderson District in 1848<14>. Reuben had one son, John S. Gentry, who appeared in the 1830 to 1850 Spartanburg census records and also in a number of Spartanburg deeds. Samuel the Younger's son, Samuel, is clearly in the 1800 and 1810 census, but is missing in 1820 even though land records suggest he was in Spartanburg in 1819 when he sold land bordering his brother Richard, bought it back in 1821 and then sold it again in 1824<11n,s,u>. The junior Samuel's name was back again in the 1830 census and in 1840. In addition to a number of younger children, some of whom were living with his widow in 1850, early census records show that Samuel had two older sons. There is no clear-cut evidence of their identity but we propose that one of these was Miles Gentry whose family appeared for the first time in Spartanburg census records in 1850. The other is believed to be a third-generation Samuel Gentry whose wife was named Hannah and who was in the 1840 and 1850 Spartanburg census. Samuel-V had a first wife by the name of Ann, identified in a deed<12d>, but he remarried in 1838 as shown by War of 1812 pension records of payments to a widow Milley after Samuel's death<10>. These same records indicate that Samuel died in 1844. The family of the next oldest son, Richard appeared in one mortgage and a number of deeds for sale of land (either as a participant or an adjoining land owner) from 1809 to 1843. In April 1843, Richard sold his home and 160 acres of land to his daughter and son-in-law Mary and Jesse Waddell<12r>. In December of the same year, the two couples jointly sold 248 acres of land on James Creek (see Map 2) to James Nesbitt. It is not clear whether this included the 160 acres of Richard's land from the April sale or was all additional land, probably the former. Richard died before 1850, and his widow, Mary was listed as living with their son, Richard Jr. in Carroll County, Georgia, in the 1850 census for that county. Their daughter, Mary, also apparently died before 1850 because Jesse Waddell was in the Gordon County, Georgia census that year with a new wife. Another Waddell, John, was also living with Richard Jr. in 1850 and married Richard Jr.'s daughter, Lydia, that same year. Richard was listed regularly in the census records for Spartanburg District from 1800 to 1840. The census records for Richard Sr. and his children are very confusing. In 1840, the records suggest that Richard Jr. and his family were living in the same household with his parents. In 1830, the widow and child of another son, William, appear to have been living with Richard Sr. Richard seems to have had six daughters who have not been identified in addition to his known daughter, Mary. The youngest of Samuel the Younger's son, Nathaniel ("Nate"), was also listed regularly in the Spartanburg District censuses beginning in 1810 and continuing until 1850. The listings included a variety of names: "Jonathan" in 1810, "Nathan" in 1820, and "Nath'l" in 1840. Nathaniel died in 1852 leaving a brief will disposing of his estate to his wife, his children, only three of whom were specifically named in the will, Samuel, John N., and Nancy, and a grandson Nathaniel (son of John)<15>. Three other daughters, and their husbands, have been identified, however, from probate settlement records, Francis, Polly (Mary), and Judy Ann. Another daughter, Elizabeth, was living with Nathaniel and his wife in 1850. All of these children can be found in the 1850 Spartanburg census with the exception of Nancy and with the exception that the record for the presumed wife and family of Samuel was missing Samuel himself, although he was unquestionably alive. A Richard Gentry who enlisted in the South Carolina militia in 1780 in time to participate in the battles of Kings Mountain (October, 1780) and Cowpens (1781), testified in his claim for a military pension that he had enlisted from Union District, South Carolina, near the Tyger River<16>. This was just a short distance downriver from where the Spartanburg Gentrys lived. Richard himself may well have been living in Spartanburg District and traveled for enlistment to the nearest marshaling point which was in Union District. He indicated further that he had been born in December 1755 in Lunenburg County, Virginia. There has been controversy as to Richard's connection with the rest of the Samuel-II Gentry family. This has been described in the October 2002 issue of the Journal of Gentry Genealogy in the article on the family of Richard-III Gentry. We will not repeat the arguments here except to say this author does not believe the war veteran Richard was a son of Richard-III, rather that he was a brother of Samuel the Younger, and a son of Nicholas-III. The fact that Richard was born in Lunenburg County, Virginia, ties him to the extended family of Samuel-II, and correspondingly strengthens the belief that the Spartanburg Gentrys were also a part of this family. Richard left no trail in South Carolina, either before or after his enlistment in the militia. He is known to have married Gestin (or Justina, also Justin, Justiney, Gestine) Hudspeth in 1793 in Surry County, North Carolina. ["Hudspeth" was the Surry County spelling for Gestin's maiden name. Military pension records are filed under the name "Hedgepeth".] Gestin testified that she was acquainted with Richard before and after his military service but did not know him well (probably from visits by Richard to Surry County from time to time). Richard moved from Surry County in about 1801 to Kentucky, first to Lincoln County, then to Rockcastle County. All of Richard's known children result from this North Carolina marriage. If he married earlier during the period after his discharge from the army, and had any other children, there is no record of them. Richard died in 1836 in Kentucky. There have been suggestions based on the 1790 Surry County census record for a "Richard Gentry Jr", that Richard the war veteran had married earlier before his marriage to Gestin and had several children by that marriage. None of these are found in later records, and the 1820 census for Rockcastle County, Kentucky (the first in which Richard appeared after he left North Carolina), shows Richard's children all born after 1790, thus after his marriage to Gestin. We have discussed above, a Nathaniel Gentry who was the son of Samuel the Younger and who died in Spartanburg District in 1852. Before he was even born, there was an older Nathaniel Gentry who was living in Spartanburg District. This Nathaniel left South Carolina before 1800 and appears to have been the same Nathaniel as was listed in the Pulaski County, Kentucky census for 1810. Interestingly, the first record of Nathaniel is found, not in South Carolina, but in the Surry County, North Carolina tax records in 1782<3>. In that year four Gentrys from South Carolina were present in Surry County at the time of the annual tax assessment. The writer has presumed that the timing of this visit corresponded with a period right at the end of the Revolutionary War when great numbers of North Carolina Tories fled the state. Their confiscated or abandoned lands became available for claiming by prospective new owners and the South Carolina Gentrys may have been on a scouting expedition. It is significant that these four visiting Gentrys, namely: Nathaniel, Hezekiah, and Hezekiah's sons Runnel [Reynolds] and Robert were apparently transients and were taxed only for their horses and not for any land. Nathaniel was listed in the 1790 Spartanburg District census with a family of eight which included one son over 16 and three younger sons. He is listed twice in indexes of South Carolina land grants, once for a grant dated 1785 for acreage on the Tyger River and again in 1793 for land on the Pacolet River across the northwestern border of Spartanurg District (see Map 2) in Greenville District<18>. The only other reference to him is for his selection as a juror for the County Court in 1789. A Matthew Gentry, who is nowhere else mentioned in Spartanburg records, appeared in Spartanburg District Court in 1796<17>. He is a prime candidate for being the adult son of Nathaniel who was living with the latter's family at the time of the 1790 census. Both Nathaniel and Matthew's names disappear from South Carolina records after 1796. A Nathaniel Gentry found in Pulaski County, Kentucky in 1810<21c> is proposed as being the same Nathaniel. The Pulaski County census record implies the presence of Nathaniel and a younger family consisting of a husband, (presumably a son of Nathaniel), a wife (presumably of the son, not Nathaniel), and either ten or eleven children. There is no further trace of Nathaniel after the 1810 census which is understandable since he would have been about 65 years old by then. (Nathaniel has been estimated as being born about1740 based upon ages of his presumed children). A Gentry family which appears once in South Carolina records was in the 1790 Spartanburg census, and has been the subject of much discussion as to its identity. The name in the census record has been written over, but has been interpreted as being "Tyreh". He is the subject of an article in the Gentry Journal published as issue #11, volume 2, in November 2002. The family is described in considerable detail there, and will not be discussed further here. Over a period of almost two years, this Journal has undertaken to provide as complete a description as is presently possible of Samuel-II Gentry, second son of Nicholas the Immigrant. Beginning in July 2001 (vol 1, issue #7), these articles have discussed in depth both Samuel himself and his wife, Ann, and also have devoted entire issues to most of his children and their immediate families. We have omitted his sons Simon and John, and his daughter Ann (married French Haggard), none of whom had any surviving Gentry descendants. The description here of Samuel-III Gentry completes this series [with the exception of later additions to the brief description above of his proposed youngest son, Nathaniel]. We emphasize again that the conclusions presented in these articles are those of the author alone, and readers should not necessarily accept them as gospel truth. Facts and interpretations added to this body of knowledge over time have already changed some of the original proposals and more changes may possibly be introduced in the future. 1. Margaret M. Hofmann, "The Granville District of North Carolina, 1748-1763"
John Spencer granted 700 ac in Johnston County on the south side of Neuse River joining Brogdens line. Signed: John Spencer; witness: J. Ballard, Robt Rainey. Surveyed 5 May 1761; chainbearers Millington Blaylock, Saml Gentry; Charley Young surveyor. Vol V "Abstracts of Misc Land Office records"
Plat for John Spencer, 700 ac in Johnston Co., on the south side of Neuse River joining Brogdens line. Chainbearers: Mickington [?] Blaylock, Samuel Gentry; Charles Young, surveyor. Plat for David Allen, 520 ac in Johnston Co. on both sides of Neuse River, joining Reynold Allen. Chainbearers: Saml Gentry, Robt Cook; Charles Young, surveyor. [Refr #4403, a warrant for survey, refers to Neuse River at the mouth of Cedar Creek]. James Vaughn to William Allen, for 93 pounds, 200 ac on Mountain Creek and Meherrin River adj. Andrews and Arnold, devised to James Vaughn by his father's will. Wit. John Williams, Turner Allen, Samuel (S) Gentry. Recorded 14 Mar 1768. 1. Original records in North Carolina Dept of Archives, filed by county and by year, data transcribed 1982 by this writer. Miscellaneous undated lists filed together, are recorded below according to approximate date estimated by format of list and content of listings. 5. Mrs. Robert Taylor, "1782 Tax List of Surry County, North Carolina", Cimarron, Kansas, 1974. 7. Luther Bird, 1771, 1774-5, 1784-1786, 1813 records transcribed 1944 (filed with original records in State Archives files). State grant to Michael Henderson 400 ac ... on the head waters of Deep Creek beginning at a small branch of said creek, along a line agreed with Samuel Gentry, to top of Fox Nob, to a line agreed with Moses Woodruff, then variously back to the beginning. State grant to Samuel Gentry 400 ac ... on the head waters of Deep Creek on the north side of Fox Nob Mountain, beginning in Michael Henderson's line, then WNW, then WSW [adjoining Moses Woodruff], then south, then west, then south, then east to the top of said mountain along the same NE to Henderson's line, then to the beginning. Samuel Gentry heirs to Humphrey Cockerham 400 ac. Allen Gentry, Nicholas Gentry, Jeremiah Gentry and Samuel Gentry, joint heirs of Samuel Gentry, dec'd, of the State of South Carolina, of the one part; to Humphrey Cockerham of Wilkes County of the other part . . .for the sum of four hundred pounds, sell a track of land containing four hundred acres lying in County of Surry . . . on the headwaters of Deep Creek, on the Fox Knob mountain, beginning at . . . Michael Henderson's (now John Martin's) line, on the north side of the mountain . . . lines agreed on by Moses Woodruff . . . to the top of said mountain. [Signed with mark of four heirs]. Wit: William Cook, John Moor, Thomas Sparks. Humphrey Cockerham of county of Wilkes to Moses Woodruff 100 ac . . . land on Fox Knob adjoining Moses Woodruff's land, being part of a tract of land formerly granted to Samuel Gentry dec'd. Wit: John Cook, W. Patterson. Allen Gentry defendant for debt owed Zebulon Bragg. Defendant not appearing in court, judgment for the plaintiff by default. Court convened. Drawing of petit jurors included Jerry Gentry, Ruth P. Gentry (presumably a man; misreading of "Reuben"?). Jeremiah Gentry indicted on charge of arson; jury found "no bill". Deed references to the family of Samuel Gentry the Elder. Nathaniel Gentry (Spartanburg) to Zabulon Bragg (same); [mortgaged for] 200 pounds [to be paid] in 15 years for 100 ac on S. fork Tyger R; borders a pine tree Nathaniel sawed in the presence of Allen Gentry (and others). Deed for land on branch of Fergeson's Cr; borders Allen Gentry. Deed for land on both sides, S fork Tyger R; borders Jeremiah Gentry (on N), and Nicholas Gentry (on E). Jeremiah Gentry witnessed deed for sale of land on S. side Tyger R.
Deed for land on S. side Fergeson's Cr; borders Allen Gentry. Allen Gentry (Spartanburg) to Thomas Price (same); for $150 SC money, sold 50 ac on both sides Fergeson's Cr. (part of grant to Enoch Floyd). (Bought 1793). Nicholas Gentry (Spartanburg) to George Brewton (same); for $100 sold 50 ac; borders Forgason's Cr. on N.
Nicholas Gentry (Spartanburg) to Samuel Eskridge (same); for $550 sold land (ac omitted) on SW side of Ferguson's Cr. Nicholas Gentry (Spartanburg) to Richard Willis; for $55 sold 52 ac on N. side of Tyger R. Dower renounced 8 May 1822 by Sarah Gentry. Nancyann Wilmott (Spartanburg District) to Samuel Floyd (S.C.) for $320 sold 170 ac whereon Levin [Sevier?] Gentry [son of Nicholas] now lives. Borders Furgesons Creek, south side of Tyger River, Floyds Creek. Wit: Mereday Vise, John Vise. Signed Nancy (x) Wilmott. Joseph Wofford to Levier [Sevier?] Gentry, sold land on South Side of Tyger River where John White decd formerly lived. Wit: James Bennett, Wm Bennett. Signed Joseph Wofford. Sally Gentry [widow of Jeremiah?] (Spartanburg District) to Christopher Rhodes (same) for $100 sold 230 ac on Enoree River. Vehorn, loc. cit, "Books X-Z (1839-1848)"
William A. Young (Spartanburg District) to Thomas Young (same) for $474 sold 87 ac on south side of Tyger River, bordering Rily Gentry [son of Nicholas]. Wit: Moor Bragg, Wm Young. Signed Wm A. Young. Sally Gentry (Spartanburg District) to Thomas Gore (same) for $75 sold 230 ac on Enoree River. Wit: Jeremiah Stroud, M. Casey. Signed Sally (x) Gentry. Thomas Gore (Union District) to Allen Gentry (Spartanburg District) [son of Jeremiah] for $80 sold 100 ac on Enoree River. Wit: M. Casey, James Watson. Signed Thomas Gore. Thomas Gore (Spartanburg District) to Sarah Gentry (same) [widow of Jeremiah] for $60 sold 30 ac on Enoree River bordering . . . Allen Gentry, said Sarah Gentry. Wit: John F. Casey, J. W. Harris. signed Thomas Gore. Gentry, Samuel, Milley, (1st h Hindman) 2nd wife, WC-8529, m 15 Jan 1838 Spartanburg Co., SC, sd 9 May 1844, wd 28 Aug 1878, srv Ford's SC Mil, lived Spartanburg Co., SC, 1st wife ? Deed for 35 ac of land between N and S forks of Tyger R, part of grant to Abuatus Bright who sold to Samuel Gentry. Reuben Jentry witnessed deed for sale of land on S side of Pacolate R. and both sides of Lindsey's Cr. Reuben Jentry witnessed deed for sale of land. Richard Gentry (Spartanburg) to John Meaders (same); Richard [mortgages for $60 with interest due 20 Feb 1800 (sic)] 199 ac where [he now] lives (plus various animals, corn, fodder, furniture, and other personal belongings). Deed for land on N side of Jemmie's [James] Cr; borders Richard Gentry;. Deed for sale of land; borders Richard Jentry, Samuel Gentry. Deed for land on fork of Tyger R.; borders Nathl. Gentry's Spring Br. and N. Gentry land. Deed for land in fork of Tyger R. below Shurley's old bridge; borders Nathl. Gentry. Deed for sale of land on N side of Jamie's Cr; borders Richard Gentry. Deed for land; borders Richard Gentry. Rec. 2 Nov 1818. William Arnold (Madison Co., Miss) to Samuel Gentry (Spartanburg); for $60 sold 15 1/2 ac; borders Richard Gentry and Samuel Gentry. Rec. 15 Sep 1819. (Sold 1819). Deed for land in fork of Tyger R.; borders Gentry. Samuel Gentry (Spartanburg) to Elisha Thornton (same); for $60 sold 15 1/2 ac on branch of Furgason Cr. of Tyger R; borders Richard Jentry. [Bought 1818]. Deed for sale of land on fork of Tyger R; borders Nathaniel Jentry. Richard Gentry (Spartanburg) to John Shurley (same); for $187 sold (ac omitted) at head of branches of Ferguson's and Jemme's Creeks; borders Richard Gentry's own land. Reuben Jentry to Isaac Crow (Spartanburg); for $400 sold 125 ac on waters of Tyger R, part of where Reuben Gentry lives and sold to him by Burrell Boro; witness Cassander Johnson Jentry. Nathaniel Jentry witnessed deed for land on N side of N. Tyger R.
Elisha Thornton (Spartanburg) to Samuel Jentry (same); for $60 sold 15 1/2 ac; borders Richard and Samuel Jentry (on W); witness John Gentry. [Rebought land sold in 1819]. Richard Jentry (Spartanburg) to John Mason (same); for $56 sold 14 ac; borders Richard Jentry on N and E.
Samuel Gentry (Spartanburg) to Richard Willis; for $60 sold 20 ac on S. side of Tyger R; borders Richard Gentry. Nathaniel Gentry (Spartanburg) to John Shurley (SC); for $205 sold 75 ac on N. Tyger R.; witness John Gentry. Joseph Floyd to John Gentry [son of Reuben], for $75 sold 150 ac in Greenville District originally granted to William Clayton in 1793. Wit: John Trail, Enoch Floyd. Signed Joseph Floyd. Ford Mason to Nathaniel Gentry, for $600 sold 132 ac in the forks of the Tyger River. Wit: James Nesbitt Jr., William Wright. Signed Ford Mason. John Mason (Spartanburg District) to Richard Gentry for $300 sold 77 ac where sd Mason now lives. Wit: Daniel Durham, John Ward. Signed John Mason. Samuel Gentry (Spartanburg District) to Samuel Waldrip (same) for $275 sold 100 ac on two mile Creek, the waters of Enoree River, being part of 400 ac formerly granted to Thomas Fuller. Wit: J. Underwood, G. M. Hobby. Signed Samuel (x) Gentry. Dower relinquished by Ann Gentry, 18 Dec 1834. Rec 10 Sep 1838. Moses White (Spartanburg District) to Samuel Gentry (same) for $469 sold 134 ac on both sides of road leading from Rogers Bridge [just below junction of N. and S. forks of Tyger River] to Z. Hobby's near forks of aforesaid road and Hills factory road, being land originally granted to Wm Earnest. Wit: Samuel W. Tucker, Thomas Chesney. Signed Moses White. Dower relinquished by Martha (x) White. Hutson Lanham (Spartanburg District) to Nathaniel Gentry (same) for $3000 sold four tracts of land on the Tyger River totaling 296 ac [?]. First tract of 150 ac near Market road, another adjoining tract of 242 ac bordering Tyger River, another adjoining tract of 3 4/10 ac. Wit: Leavis Shackelford, Edmond (x) Rogers. Signed Hutson Lanham. Dower relinquished by Elizabeth Lanham, 26 Apr 1839. Samuel Gentry to James Bennett (Spartanburg District) for $500 sold 134 ac on both sides of road leading from Rogers Bridge to Z. Hobby's, land originally belonging to Wm. Yearnest. Wit: S. W. Tucker, John W. Wofford. Signed Samuel (x) Gentry. Simpson Autry to John Gentry (Spartanburg District) for $175 sold 33 ac on Wards Creek. Wit: Jesse Pinson, Ransom Pinson. Signed Simpson Autry. Edward Floyd (Spartanburg District) to John Given (same), for $3.25 per acre sold 85 ac on Tyger River, bordering . . . Pinkny road . . .
Wit: Jesse Pinson, John Gentry. Signed Edward Floyd. Daniel Alexander [father-in-law of John Gentry?] and Mary Alexander (Spartanburg District) in consideration that John Gentry (same) [son of Reuben] hath upon himself undertaken to support maintain and provide for us during the term of our natural lives, we have granted all that tract of land in sd District on the south side of Rogers Spring branch, bounded . . . , containing 150 ac more or less and also two head of horses, five head of neat cattle, all my stock of hogs and sheep, farming tools and household and kitchen furniture. Wit: John Givin, Mitchell Bearden. Signed Daniel (o) Alexander, Mary (D) Alexander. Hammond Elder (Spartanburg District) to John Gentry, for $55 sold 10 ac on Wards Creek. Wit: James Barrett, Thomas G. Barrett. Signed Hammond Elder. Hutson Lanham (Spartanburg District) to Nathaniel Gentry (same) for $1,596.97 sold 165 ac bordering S. Tyger River, Charlestown Road. Wit: Paul Cornbee, Joseph Lanham. Signed H. Lanham. Dower relinquished by Elizabeth Lanham. Samuel Gentry (Spartanburg District) tp N. C. Vance for $424.59 mortgages 400 ac land whereon Samuel Gentry now lives on the road from Enoree River to Mrs. Hobby's, to be paid in full on 25 Dec next. Wit: W. D. Byrd, Samuel Stewart. Signed Samuel (x) Gentry. George Nicholls (Shff of Spartanburg Cistrict) by virtue of a write out of the Court of Common Pleas 6 Jun 1842 at the suit of Nathaniel Gentry against Edward Floyd for $223.88 damages and costs, have seized a tract of 80 ac land on Cane Creek, waters of Tyger River. Purchased at public sale by James L. Williams for $147. Wit: D. F. Mabry, J. Tapp. Signed G. Nicholls. Richard Gentry (Spartanburg District) to Jesse Waddel (S.C.) for $300 sold 160 ac land whereon said Richard Gentry now lives. Wit: Robert McCasley, Azariah Vise. Signed Richard (R) Gentry. George Nicholls (Sheriff of Spartanburg District) by virtue of a writ issued out of the court of Common Pleaas 8 Nov 1842 at the suit of Strobel & Miller against Elisha Bishop for $124.18 damages and costs, have seized 100 ac on the head waters of Lawsons Fork Creek. At public sale, purchased by Samuel Gentry for $82 who transferred his bid to James Watson. Wit: A. C. Bomar, James Nesbett. Signed G. Nicholls. George Gloyd Jr (Spartanburg District) to Nathaniel Gentry, for $207 sold 93 1/2 ac in sd District. Wit: John Gentry, Francis Ward. Signed George Floyd. Richard Gentry and Jesse Waddle (Spartanburg District) to James Nesbitt (same) for $958.50 sold 248 ac on waters of Jimmeys Creek. Wit: James M. Lanham, Jonas Brewton. Signed Richard (x) Gentry, Jesse Waddel [sic]. Dower relinquished by Mary Gentry and Mary Waddel, the wives of Richard Gentry and Jesse Waddel, 15 Dec 1843. Nathaniel Gentry (Spartanburg District) to Robert Casey, for $262 sold 93 1/2 ac in said District. Wit: Roddy Lanford, J Ann Gentry. Signed Nathaniel (x) Gentry. Elizabeth Herilson (Spartanburg District) to John S. Gentry (same) for $50 sold 112 ac. Wit: Martin O. Mitler, John Hatchett. Signed Elizabeth (x) Herilson. At the Court House: granted a citation to Reubin Gentry to admr on the estate of Samuel Gentry, decd. Granted a citation to Reubin Gentry admr. of Samuel Gentry against Nathaniel Grenty [sic] to try the right of property of said decd. "Property of Samuel Gentry decd..parties met at the house of John Meadows...Benja. Nichols says there were $50 or $60 worth of property he heard Nathaniel Jentry say was at his house of the decd; this was before the death of the dec; Isaac Crow sworn in behalf of the respondent on oath saith that some time before the decd went to his son Nathaniel to live, he heard the old man say if Nat would take him, the decd & his wife, & take care of them, that after their death he should have all they had . . . this deponent movd the decd. to Nathls with all his property, there they both died & was buried there . . ."
Reuben Gentry admr of Samuel Gentry against Nathaniel Gentry: "The complainant proves by George Roebuck that the decd. sent to the respondent for property but the respondent refused giving it up...also proved by Abagail Ward that was property was at Natts was not his nor he never should have it; proves by Nancy Thomas that about two or three months before the death of the dec. the she heard the ded. say in one of Nat's houses one night that sd. Nathaniel had brought him there & he proves by Mary Roebuck affidavit that she heard Fanny Gentry say in her lifetime at different times that her son Nathaniel was to maintain her & her husband Samuel Gentry during their lifetime and he was to have what property they left . . . ordinary decress that property belongs to respondent." At the Court House: Settlement of acct of Nathaniel Jentry against estate of James Otts. 14. Virginia Alexander, Colleen Morse Elliott, Betty Willie, "Pendleton District and Anderson County, S.C., Wills, Estates, Inventories, and Tax Records", compiled by Southern Historical Press, Easley, SC, 1980. 1848 Sep 19 Sale, estate of Reuben Gentry--to Cassa Gentry, A.D. Hembree, Amariah Felton, James Hembree, et al. #22 Nathaniel Gentry will sg. 22 Mar 1852, pr. 3 May 1852 in Spartanburg Co.
Richard GENTRY, widow Justina or Gestin, [also Justin, Justiney, Gestiney] of Rockcastle Co. KY. Credited with 13 months service as a private in SC militia. Richard Gentry appeared in Rockcastle County Court, KY, 12 Sep 1832, age 77 years as of next Dec. 27th [born 27 Dec 1755]. Testified that he had first volunteered for service in SC militia from Union District, SC, near the Tyger River [about 1780]... He gave his birthplace as Lunenburg Co. VA, and had lived three years in Lincoln Co. KY before moving to Rockcastle Co.
Gestin [Gentry] appeared in Rockcastle Co. court on 25 Nov 1839, age given as 70 years, to apply for widow benefits. She stated that she was married to Richard Gentry in the spring season of 1792 (she did not recall the month), and was married in [Surry Co., NC]. She stated that Richard died 13 Feb 1836. Gestin appeared again on 23 Jun 1842, age given again as 70 years, to testify further as to Richard's war service. She stated that she knew Richard before and during his service, but she was young and she did not know how he entered the service or where he served except what Richard told her after they were married. She recalled that he entered service in SC--she was living at the time in NC. Nathaniel Aldridge, who lived 2 or 3 miles from Gestin in Surry Co. testified that her father was Ayres Hedgepeth [Hudspeth]. James Tanner and George Walker against Matthew Gentry; appealed. Petition by Alexander McBeth & Co. against Matthew Gentry; settled by defendant in open court. 18. Leonardo Andrea, op. cit. Deed for land; borders [Nathaniel?] Gentry. Nansey Gentry (misreading of "Nathaniel"?) witnessed deed for sale of land on middle fork of Tyger R. known as Long Br. Nathaniel Gentry (Spartanburg) to Zabulon Bragg (same); bond of 200 pounds for deed to be made in 15 years for 100 ac on S. fork Tyger R; borders a pine tree Nathaniel sawed in the presence of Allen Gentry (and others). 20. "Speculations on the Family of Nathaniel Gentry of South Carolina and Kentucky (Revised)," Journal of Gentry Genealogy, Issue B, (Febr 2011). © 2014, W.M. Gentry - All rights reserved. This article may be reproduced in whole or in part for non-commercial purposes provided that proper attribution (including author and journal name) is included.